My hair is fine, and often lacks volume. It’s difficult to give it body, even when I backcomb it. Luckily, I’ve discovered a new product that I now can’t live without! I’ve been using Jean Louis David Texture & Hold Foamer to boost my hair. 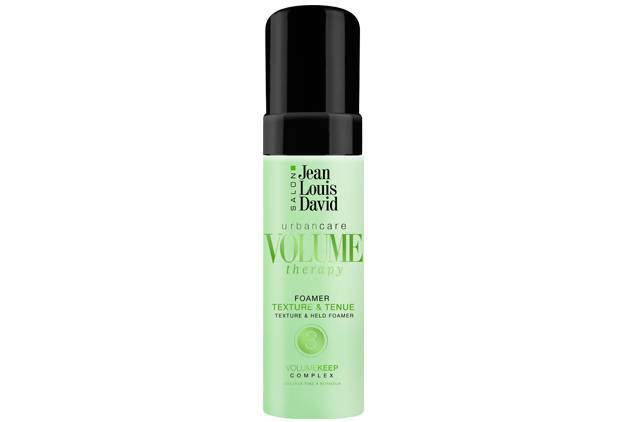 Jean Louis David Texture & Hold Foamer is great for 2 simple reasons. Firstly, the texture is sublime and secondly, because of its leave-in formula which is ultra-light weight and doesn’t weigh down my hair. It acts directly on my roots and gives them a much-needed lift. The result? My hair instantly has extra body, volume and maximum hold. The secret of this amazing product lies in its active ingredients that work on every strand of my hair. My locks feels thicker, which is a true godsend for my fine, limp hair. I’ve noticed that by using the Foamer over the last few days, it has repaired and filled out my hair where it was once lacking in body. It’s now easy to brush, shiny and full of volume! I use Jean Louis David Texture & Hold Foamer after I’ve washed my hair with Soft & Tone Shampoo. Using the two together really helps to control my hair and combat its usual flat, lifeless state. Once I’ve washed my hair, I apply the Foamer directly to my roots, then dry and style my hair as normal. Now, I can create a lion-worthy mane whenever I want!